The biggest 3D wrestling sim on mobiles has arrived to demonstrate the power of the latest iOS devices! 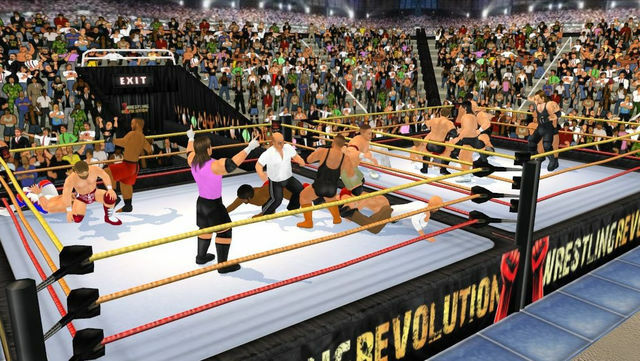 The 2D original quickly became the most downloaded and highly rated wrestling game on mobiles, and now the "Wrestling Revolution" rumbles into a whole other dimension. With a host options to help you fine tune the content for your needs, it's possible to have up to 10 wrestlers on screen at once - so many in fact that it also takes gaming's first DOUBLE ring to contain the action! You can even create your own "trainee" wrestler to go through the interactive training process with, before proceeding to a card full of various matches. But even that is just a glimpse of what will unfold over the coming weeks and months, as you watch the biggest get BIGGER with each free update! Eventually the game will then evolve into the comprehensive career mode that is already available in 2D. - Click either side of an option box to change its value. - When changing costumes, you will notice that changes are automatically inherited top-down and from right to left. If you want to fine tune, you can then move onto the other side. - It may be necessary to access a body part again before you can change its colour. - Changes to the character's "Build" will need to be reloaded with the "Update" button before they can be appreciated. - Hold over the character model to turn them around to see from all angles.